Chicago’s Ina Pinkney shares her recipe for Heavenly Hots. Known as the Breakfast Queen, Ina Pinkney was Chef and Owner of Ina’s Restaurant in Chicago’s West Loop Market District. She retired last year and published her cookbook, Taste Memories: Recipes for Life and Breakfast. This recipe along with many others can be found in her cookbook. Cooking notes: She suggests portioning out the batter using a 1/4 cup measure and using a very thin flexible spatula for turning the pancakes. 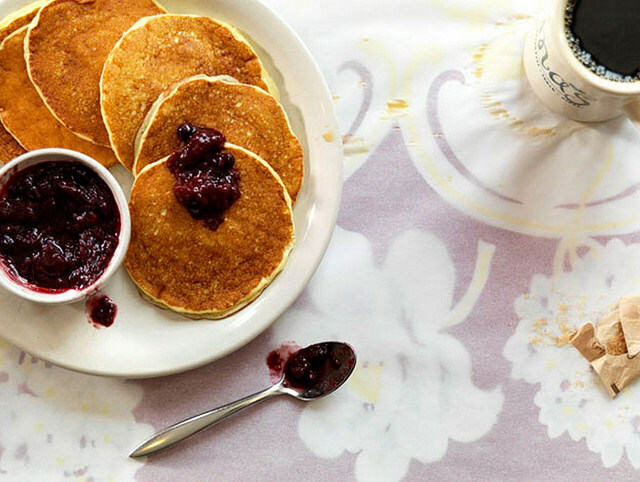 She serves them with a peach, raspberry and blueberry compote. Heat a lightly greased griddle or non-stick skillet over medium high heat. Pour large spoonfuls of batter into the skillet in batches to make 3″ circles. Cook until a few bubbles appear on the top, about 2 minutes. Turn carefully; cook until lightly browned on bottom, about 2 minutes. Nutrition information per serving: 178 calories, 61% from fat; 13 g. fat, 7 g saturated fat, 127 mg. cholesterol, 12 g. carbs, 5 g. protein, 284 sodium, 0 g. fiber.